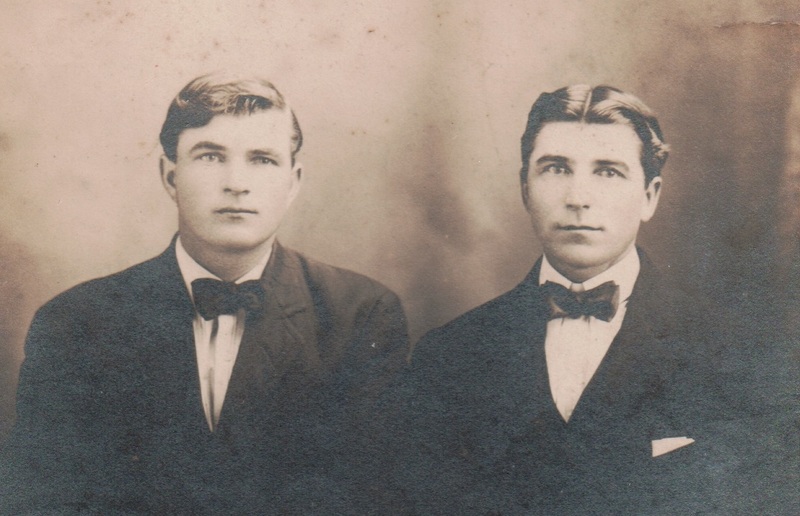 When writing about my great-grandparents Adam and Elisabeth Valek, I listed their children and what became of each. The youngest, Frank, seems to have disappeared around 1919. I think I may have found what became of him; the fly in the ointment is that there seems to be other Frank Valeks in New York State. What I really need to do is sort them all out, which is hard to do with the lack of New York records! What I found was a 1918 World War I Draft Registration with a Frank Valek listed, who has the same age and also born in New York. Frank was working as a bus boy and living in New York City with a wife, Lizzie. I also see subsequent indexes for National Guard service. Then I see Frank Valek (obviously the same one as on the Draft Card, having the same birthday) on the Social Security Death Index, dying in February 1972 in Albany, Albany County, NY. I really want to believe that these records are for my Frank. But I know my research has to be more thorough to ascertain this! I know very little about Adam and Elisabeth’s life prior to the 1910 census. So for what it’s worth, the following is to the best of my knowledge! John, born in 1886; I have conflicting evidence whether he died before 1942 or not. 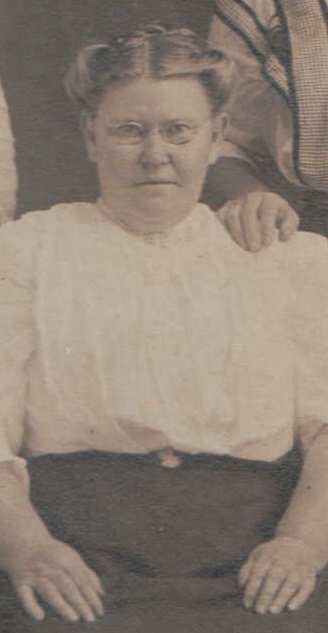 Antone George, born circa 1887 (though that conflicts with Anna’s birth, unless they are twins); married Theodora Pulaski circa 1910. Anna M., who I wrote about here. Alice E., born June 11, 1890; married Martin Aksten circa 1910; died April 1974; buried at St. John the Evangelist Cemetery in Riverhead. Joseph, born circa 1893; married Margaret, circa 1919; died 1965; buried at St. John the Evangelist Cemetery in Riverhead. Mary, who married a Mr. Wesselau (I’m not even sure of the spelling, since the source for this had botched the spellings of her sisters’ married names). Frank, born 1901 in New York state; left home around 1919 and was never heard from again. Thanks to Suffolk County’s naturalization records, I was able to find Adam’s declaration of intention paperwork! I know that he immigrated from the port of Bremen, Germany to New York, NY in May of 1893. Unfortunately, he did not remember the name of the ship! But that is enough information to narrow it down to about eight ships, so I will need to carefully comb each ship’s manifest for his name. Based on immigration dates in census records, it looks to me that Adam immigrated first and the rest of the family later (it looks to be 1899), like so many immigrants did. The Valek family eventually settled on a thirty acre farm on Manor Lane in Riverhead, Suffolk County, NY. Most of the children soon married and settled nearby. It seems that Adam sold the farm in late 1921, according to a newspaper announcement. Perhaps with Frank’s disappearance and the other children married with their own property, it was just too much for Adam to maintain. I know that Adam later lived with his son Antone, so I assume that is where he and Elisabeth moved once they sold the farm. Elisabeth died sometime between 1921 and 1925. I don’t think she ever became a U.S. citizen. Although Adam filed his declaration in November 1921, he is still marked as an “Alien” in the 1940 census, so I don’t know if his naturalization was ever completed. Adam passed away on September 26, 1942 and his estate (which netted about $7,000) seemed to be settled in 1943, divided among his children. I do not know where he or Elisabeth were buried, but I assume it was in one of the nearby Catholic cemeteries. Anna M. Valek was born on May 30, 1887 in Lithuania. To my knowledge, she was the eldest daughter and third of Adam and Elisabeth Valek’s children. Different censuses place the year of Anna’s immigration anywhere between 1897 and 1900. 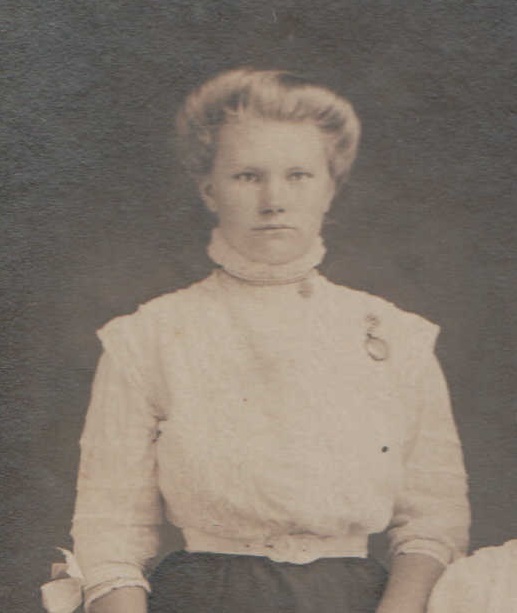 I strongly suspect that the year was 1899, when other members of her family immigrated (her father was the first to come over in May 1893). Family legend says that Anna came through Ellis Island, but I have yet to find the ship manifest with her name on it. What I really need to do is research her brothers’ naturalization records to get more possible information on her arrival. Another family legend is that Anna married her first husband, Anton “Tony” Urnezis, at the age of thirteen. I have not been able to confirm this one way or another. They were likely married in advance of their first child, John (known as Jack), born in 1908. Anna Marie (who later went by Ann) was born on August 31, 1910. There may have been a third child; the only Urnezis who I’d found on Find-a-Grave in the Riverhead area is Joseph Urnezis (born May 24, 1912, died October 15, 1912), who is buried at the Sacred Heart Cemetery in Cutchogue – the same cemetery that Anna’s second husband John Biliunas was later interred in. Personally, I think this is too much of a coincidence to discount him as a possible child, but right now I have no definitive evidence that he was born to Anna and Tony. Although Anna’s parents were already established in Riverhead by the 1910 Census, it seems that the Urnezis family didn’t purchase land their until early 1912. Tony bought the Herrick Lane/Sound Avenue from a Mary Hallock. This farm is supposedly where Tony had a fatal accident; I don’t know what or when exactly, but of course it was before Anna re-married. In my previous post, I’d covered Anna and John Biliunas’s children, as well as John’s naturalization. I’d always wondered if Anna’s citizenship hinged on John’s status. After all, in the 1925 New York Census, John stated that he had “filed papers” and Anna noted “same as husband”. However, in 1922 the United States passed the “Cable Act”, which stated that women could gain citizenship on their own. She would not have to file a declaration of intention (which explains why there is no paperwork filed with Suffolk County), yet she is counted as a citizen by 1930 and did eventually obtain a Social Security Number. I’m not sure exactly how it would have worked with her citizenship – she did not seem to be naturalized with her husband. This definitely would require some offline research. Anna was widowed once again in 1948. I don’t know how long she stayed at the farm, but I do know that she purchased land on Bay Avenue in Mattituck, Suffolk County, NY near the beach in 1950. I believe that her son Jack eventually moved there (he definitely lived on Bay Avenue by the 1970s) and I believe she lived with him toward the end of her life. And when was that, you ask? Anna died in April 1983 in Mattituck; yes, she was pushing 100! Although I was a full-grown eighteen years old when she died, I never got the opportunity to meet her. I can only hope she knew that a great-granddaughter would have loved to meet her! 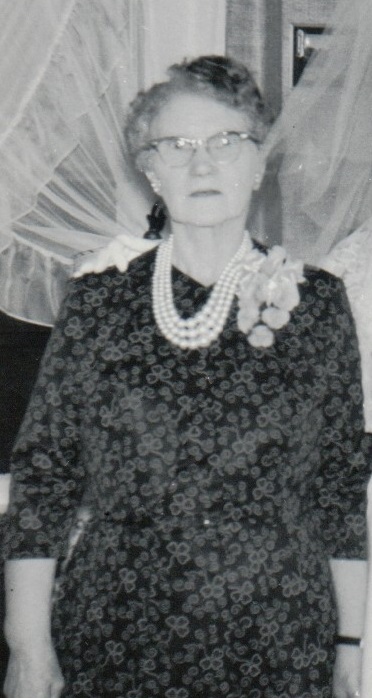 Anna in June 1964. Author’s collection. As I struggled to put together this blog post, I wondered why? I had the basic high points of my maternal great-grandfather’s life; usually that’s been enough to get me going. I guess I sensed that John Peter Biliunas had a bigger story to tell. Now I think that who he was ties into the things that were bigger than himself: his family and his country. John was born on September 16, 1886 in Lithuania. His US World War I Draft Registration does show his place of birth, which looks something like “Viaule” or “Virule”. (I’ve ruled out it beginning with “N”, based on the other writing on the form.) What do you think? I have no idea who John’s parents were, but I know he had at least one brother (Anthony William) and perhaps two more (Ziborios and Kazimeras, according to some photos that my aunt has). I believe that John was the first to immigrate to the United States in 1907 (according to the 1920 census); Anthony followed in 1910. I strongly suspect that John came through Ellis Island, though I still need to order his naturalization paperwork. John and Anthony Biliunas. John had brown hair and blue eyes. Author’s collection. Somehow, John met an married the young widow Anna (Valek) Urnezis, probably no later than mid-1915. With Anna, he got more than a wife, but a farm on the corner of Sound Avenue and Herricks Lane in Riverhead, Suffolk County, NY, and two young children: John and Ann Urnezis (who were born 1908 and 1910, respectively). 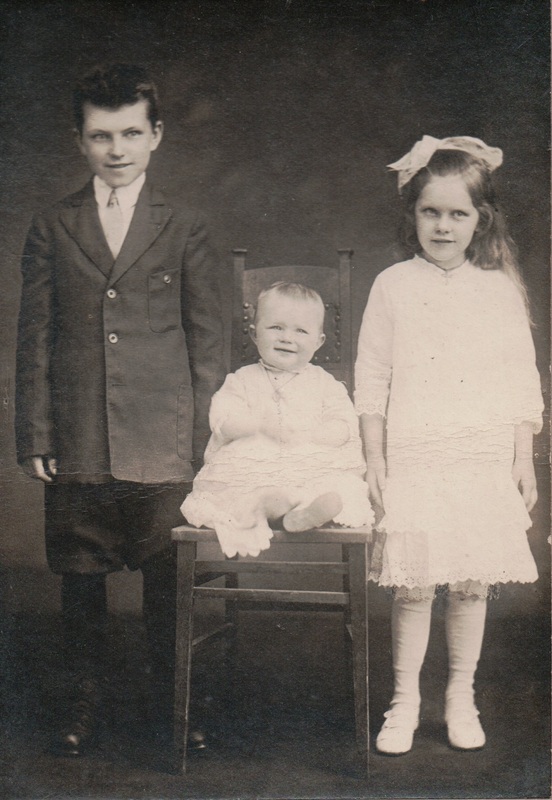 Soon young John and Ann had a little sister born on June 7, 1916: Viola Alice (my grandmother)! John Urnezis, Viola Biliunas, Ann Urnezis. Author’s collection. On his June 5, 1917 Draft Registration Card, John noted that he had a wife and three children depending on him for support. He also noted that he had filed his intent to become a citizen of the United States. Certainly Riverhead was established in his heart as home. Two more children were born to John and Anna: Bruno Antone (or “Bert”) on September 6, 1917 and Evelyn Mary on April 20, 1920. The family was now complete. December 21, 1926 was a big day for John: he was part of a group of 88 immigrants – the largest in Suffolk County history at that point – who became U.S. citizens. New York Supreme Court Justice James A. Dunne presided over the ceremony, at which each new citizen was presented with an American flag. (How I wish I knew what happened to John’s flag!) Mrs. Joseph Townsend, a member of the Daughters of the American Revolution, spoke at the ceremony. She encouraged the new citizens to join a church if they hadn’t already, and to obey all the laws of the land, especially the Eighteenth Amendment (the Prohibition one!). I have to wonder if the whole family was there to witness the event. Perhaps Anna and the children were all dressed up, along with other families. 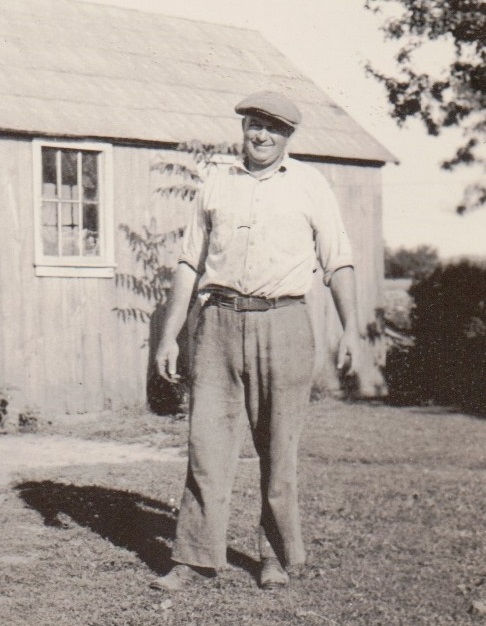 John Biliunas in the 1930s in Riverhead. Author’s collection. Other than his children’s marriages and the births of most of his grandchildren, John’s naturalization was the last major documented event in his life. He passed away on January 27, 1948 at home. His funeral was held four days later at Sacred Heart Church in nearby Cutchogue and he was buried in its graveyard. That’s all I know about John Biliunas so far. Next time we will look at his wife, whose long life and surrounding family tell us even more.